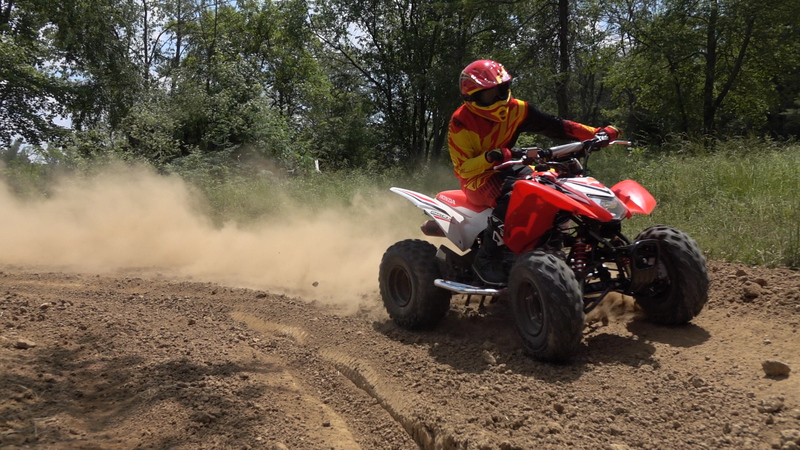 Honda’s TRX250X, formerly known as the TRX250EX, is a nimble handling, peppy running, sporty looking machine that’s great at getting new riders hooked on the fun ATVing. 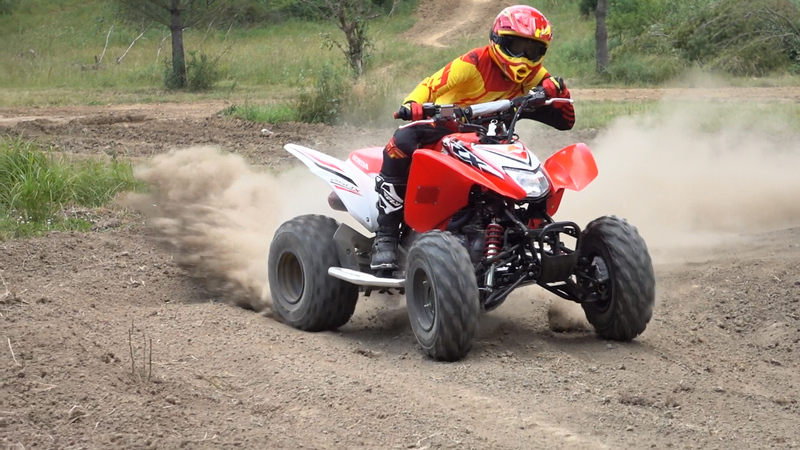 Honda’s TRX250X, formerly known as the TRX250EX, is a nimble handling, peppy running, sporty looking machine that’s great at getting new riders hooked on the fun ATVing. Its reliability allows it to be handed down in families again and again adding a lot to its value. One of the best things about it is that it’s a machine that younger riders can afford to save up for and purchase. Like any other sport, new riders tend to improve at the fastest rate in the beginning. In motor sports, even recreational ones, this often results in a desire for upgrades and performance parts. 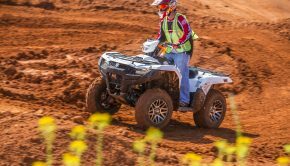 Based on our review of the 2016 250X and our time spent riding the machine since, we put together an upgraded version of the 250X and 250EX looking to improve it in every way while covering some absolute essentials. 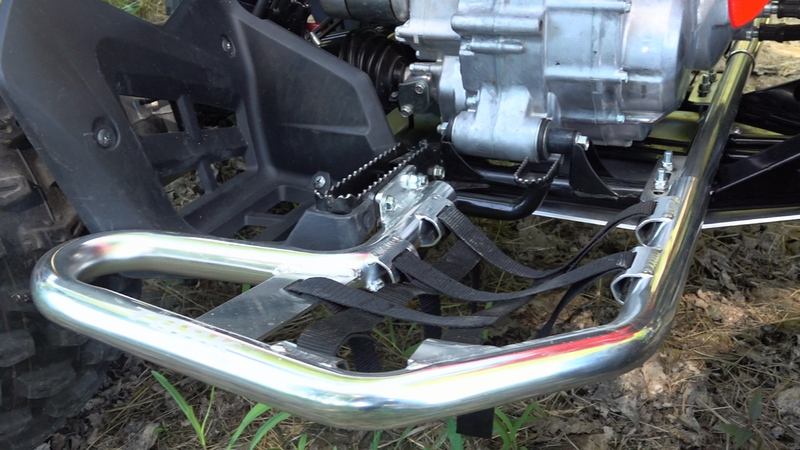 To add protection, we installed a full frame skid plate and rear differential guard from Ricochet Off-Road. 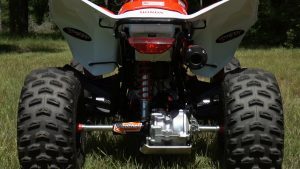 Beginning with the essentials, the 250X has a rather glaring issue that should really be addressed if you plan on doing any serious trail riding; the lack of a chassis and engine skid plate. There’s not even a plastic one. 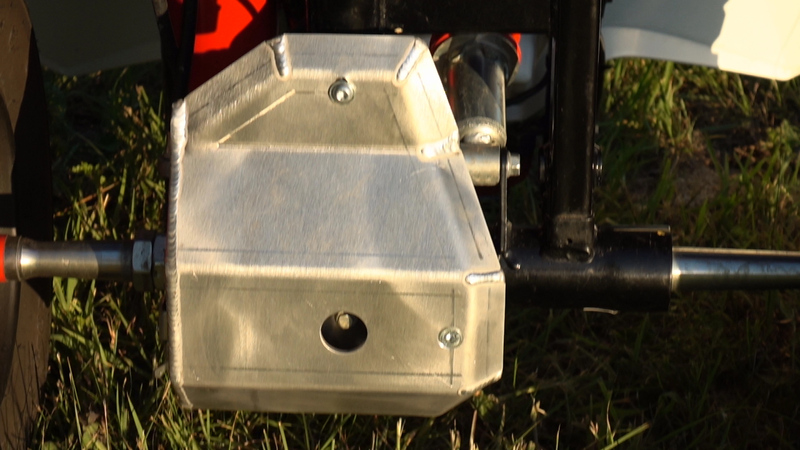 To add protection, we installed a full frame skid plate and rear differential guard from Ricochet Off-Road. Made in the United States, both skid plates are constructed of 5/16” 5052 H32 aluminum and come complete with all the necessary mounting hardware. The frame skid attaches with chromoly steel clamps that are heat treated for strength and zinc plated for corrosion resistance. Both plates are tightened with zinc-plated, T-40, torx head bolts that are rounded to resist snagging on an obstacle. Their lock nuts are guaranteed not to rattle loose. Ricochet’s skid plates can be ordered in a number of anodized colors, but we stuck with silver to keep them looking their best for the longest period of time. Made in the United States, both skid plates are constructed of 5/16” 5052 H32 aluminum and come complete with all the necessary mounting hardware. Ricochet lists their chassis skid plates for all years of the Honda Recon utility ATV and 250EX sport ATV, but does not list it on their site for the later reintroduced and restyled 250X. Both the frame and differential skid plate bolted up perfectly, with the exception of having to remove a small amount of material off either side of the front of the frame skid plate where it wraps up behind the front bumper. 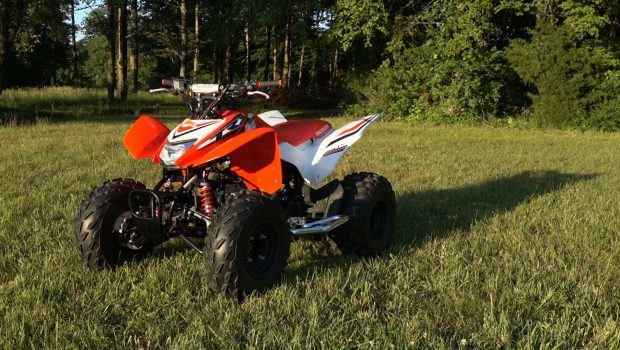 Honda must have redesigned the front bumper a bit when the 250EX was turned into the 250X. Again, this is absolutely no fault of Ricochet’s as they don’t actually list these for the 250X. It took about 20 minutes with a drill and a cutting wheel to narrow up the front and shave off the edges–– no big drama. Out on the trail we were much more confident working our way through rocks and over logs without the fear of damaging our engine or continuously beating on the frame. 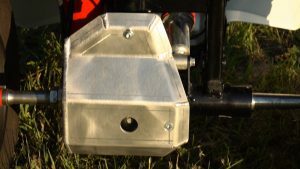 The smooth surface of the Ricochet skid plate allows you to more easily glide over obstacles without getting hung up, and impacts to the underside of the machine are more evenly dispersed. 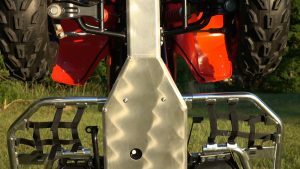 If you want to spend a little money on your Honda, Ricochet’s chassis skid plate is the best place to start. If you ride in rocks or plan on running smaller tires, then we’d recommend adding Ricochet’s Differential guard as well. Like the other Ricochet skid plates we’ve tested over the years, they’re holding up just fine to abuse. If you want to spend a little money on your Honda, Ricochet’s skid plates are the best place to start. Like the other Ricochet skid plates we’ve tested over the years, they’re holding up just fine to abuse. 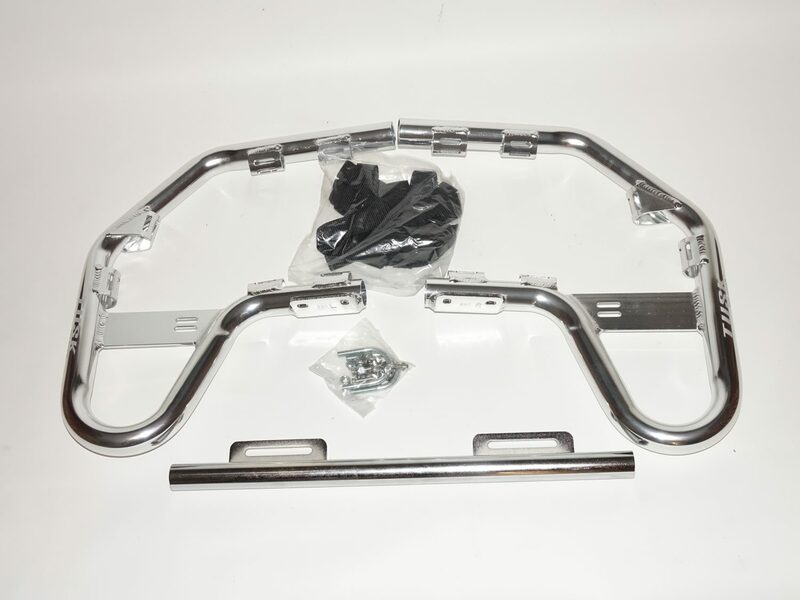 Tusk Comp Nerf Bars are available through Rocky Mountain ATV. For around $100, they are surprisingly good. They’re constructed of 1 3/8” aluminum tubing and are available in brushed silver, black, or red with a laser etched logo. All of the necessary mounting hardware comes in the box. Adding Nerf Bars adds a higher level of protection for the rider. It helps prevent you from running over your leg should your foot slip off the peg, and it helps prevent becoming entangled with other riders’ wheels and tires. While we typically don’t skimp on safety, the outrageous price of many Nerf Bars had us looking for a more affordable option. Tusk Comp Nerf Bars are available through Rocky Mountain ATV. For around $100, they are surprisingly good. They’re constructed of 1 3/8” aluminum tubing and are available in brushed silver, black, or red with a laser etched logo. All of the necessary mounting hardware comes in the box. The tabs offered plenty of room to make attaching the nets easy. They bolted up with no bending or tweaking required, something we can’t say for some far more expensive Nerf Bars. A steel cross bar bolts to the frame with U-bolts; then either side slides over the center tube. 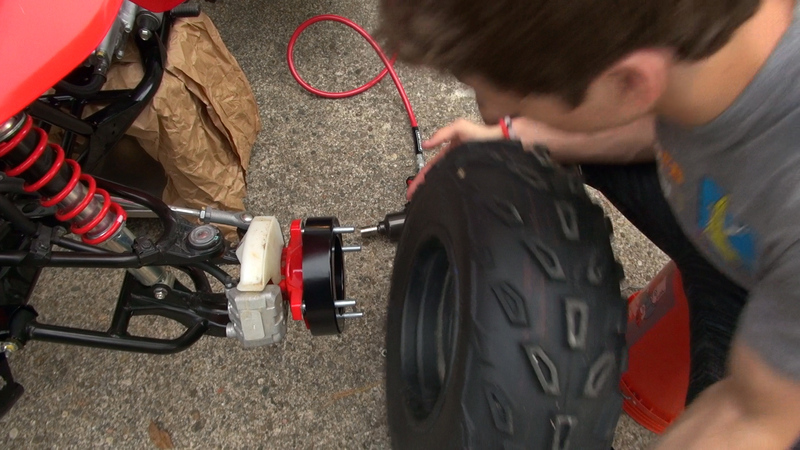 The hardest part was drilling a hole through the ATV’s footpegs, which is often required when mounting up Nerf Bars. All bolted up, we were happy how strong and rigid they felt considering how light they were. All bolted up, we were happy how strong and rigid they felt considering how light they were. The nets aren’t the thickest we’ve seen, but they’re not so light that we found it concerning. 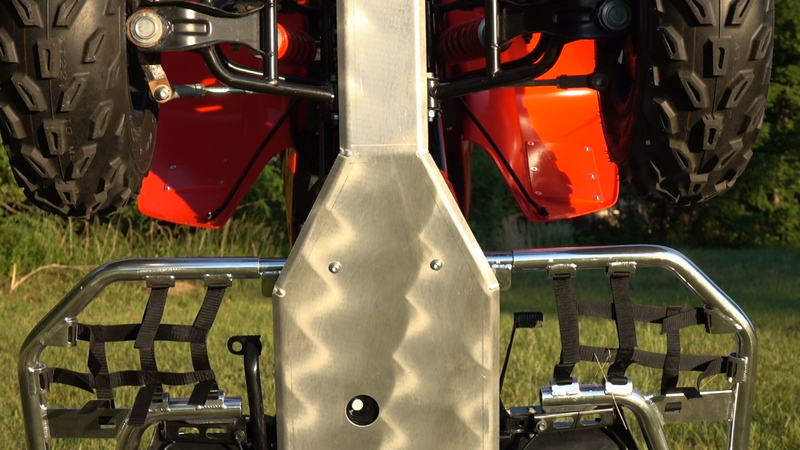 We might spend a little more on some expensive boutique Nerf Bars if we were building a serious race quad, but Tusk’s Comp Series Nerf Bars did a good job of adding some safety and style to this recreational build for what seems like a great deal. Tusk’s Comp Series Nerf Bars did a good job of adding some safety and style to this recreational build for what seems like a great deal. To dampen vibration and reduce the feel of bumps transferred to the rider, we installed a set of 15-degree sweep, Quad low band Flexx Handlebars from Fasst Company. The stock 250X are a little harsh over smaller bumps, and the pushrod engine emits a notable amount of vibration at lower RPMs. To dampen vibration and reduce the feel of bumps transferred to the rider, we installed a set of 15-degree sweep, Quad low band Flexx Handlebars from Fasst Company. Flexx handlebars are made in the USA and are loved by many top ATV racers for their ability to improve comfort and reduce fatigue. Their hinged design used two elastomers on either side. One absorbs impacts while the other prevents a topping out sensation on the return stroke. Their action can be made firmer or softer depending on which elastomers you install and how much you tighten the preload screw. 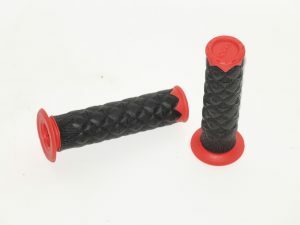 They come with red compression and rebound elastomers installed from the factory. We swapped out the compression elastomers for the next softest, yellow elastomers running minimum preload, helping the bars better deal with bumps that get past the shocks. If you’re not sure what setup is best for you, Fasst Company is great when it comes to helping customers maximize the performance of their bars, even after they’ve taken your money. Their action can be made firmer or softer depending on which elastomers you install and how much you tighten the preload screw. To adapt from 7/8” to our larger diameter 1 1/8” Flexx handlebars, the ergonomic experts at Rox Speed FX recommended we run a set of their two-inch, pivoting, handlebar risers. To adapt from 7/8” to our larger diameter 1 1/8” Flexx handlebars, the ergonomic experts at Rox Speed FX recommended we run a set of their two-inch, pivoting, handlebar risers. 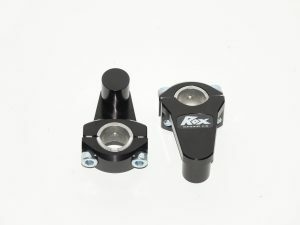 Unlike block style risers, Rox’ pivoting risers allow you to move your handlebars forward or rearward, letting you adapt the cockpit to different sized riders. 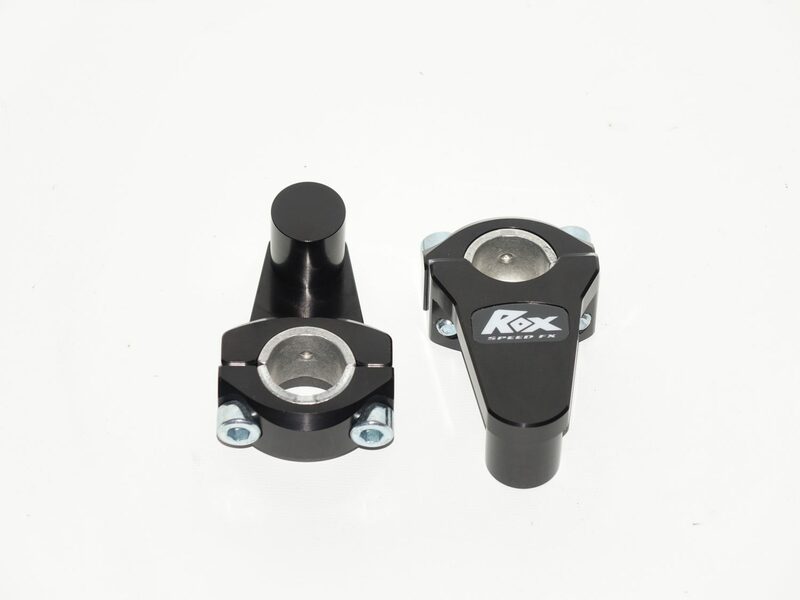 Rox bar risers are made in the USA of billet aluminum and feature a lifetime warranty. We have sets that move from ATV to ATV and haven’t worn out, plus their zinc plated bolts are far more corrosion resistant than brands we’ve tried coming out of China. 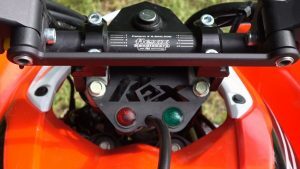 We read in a forum about a rider using a Rox Speed FX 400EX dash panel to relocate their 250X’ key switch, reverse, and neutral lights for aftermarket handlebars. We tried it and it worked perfectly. 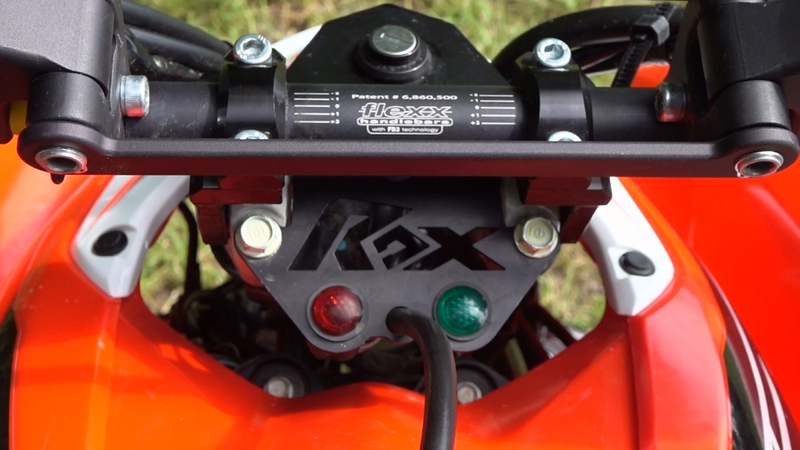 We read in a forum about a rider using a Rox Speed FX 400EX dash panel to relocate their 250X’ key switch, reverse, and neutral lights for aftermarket handlebars. While Rox had not yet tested its setup, we tried it and it worked perfectly. Spider, Slim Line SLT grips feature Spider’s dual layer technology with a vibration damping inner core and a super tacky surface. A small inner flange helps protect the rider’s hands from the throttle and switch cluster. Spider Grip’s Slim Line SLT grips are a bit slimmer than our favorite Spider A3 grips making them a little better for smaller hands. They feature Spider’s dual layer technology with a vibration damping inner core and a super tacky surface. A small inner flange helps protect the rider’s hands from the throttle and switch cluster. Available in a bunch of colors, the red/black combo added a nice accent to our X’s looks. The bars are a bit wider than stock. 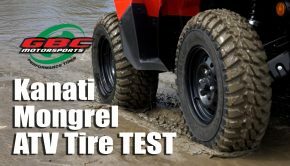 All of our test riders were comfortable with their width, but you could remove an inch from either end for smaller riders. On the trail, the bars delivered exactly what we were looking for. The straighter bend and slightly wider bars put you in a more aggressive riding position improving leverage and control. Helping make up for the stock entry level shocks, square edged bumps, bottomed shocks, and the occasional frame out are all far better dampened from the rider’s hands. 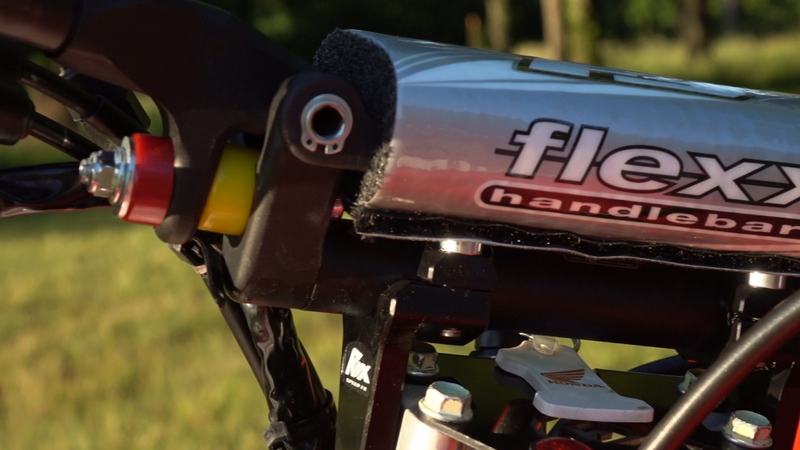 Clearly, the Flexx bars are great for racers and recreational riders alike. 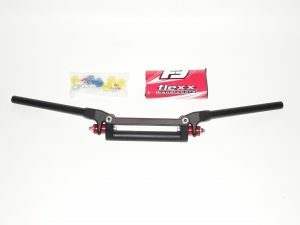 Helping make up for the stock entry level shocks, square edged bumps, bottomed shocks, and the occasional frame out are all far better dampened from the rider’s hands. 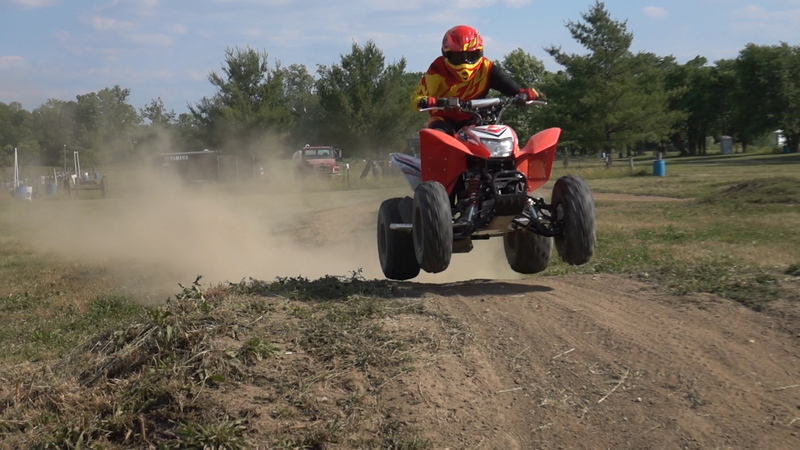 Clearly, the Flexx bars are great for racers and recreational riders alike. The combination of the Flexx bars and Spider grips notably dampened vibration levels at lower RPMs where they are most pronounced, all of which add up to more time spent on the machine with less fatigue. At 41.5” wide, the TRX250X is a bit narrow by today’s trail standards. Unfortunately, there are no aftermarket A-arms available for the X, but upgrading A-arms and suspension would be costly. There are widening kits available with brackets that bolt to brackets widening out the A-arms’ mounting points, still not the ideal way to widen your machine. With incredibly light steering, minimal bump feedback, and limited horsepower, we decided to try wheel spacers to widen our 250X. DuraBlue’s EZ Fit Urethane wheel spacers are made in the USA of Durablue’s exclusive urethane and titanium compound, making them 60% lighter than aluminum wheel spacers The EZ Fit wheel spacers come complete with studs that thread onto your stock hubs’ pressed-in studs. The wheel spacers slide over the longer studs; then your wheel bolts on like normal. we opted to go with the +1.5” DuraBlue wheel spacers all the way around for added stability while minimizing any unwanted side effects. DuraBlue’s EZ Fit Urethane wheel spacers are made in the USA of Durablue’s exclusive urethane and titanium compound, making them 60% lighter than aluminum wheel spacers helping keep unsprung and rotating mass to a minimum. The EZ Fit wheel spacers come complete with studs that thread onto your stock hubs’ pressed-in studs. The wheel spacers slide over the longer studs; then your wheel bolts on like normal. Durablue makes two different widths, +1.5” and +2.5”. Adding wheel spacers will increase bump feedback and steering effort a bit. They also increase leverage on your rear axle, so we opted to go with the +1.5” wheel spacers all the way around for added stability while minimizing any unwanted side effects. Installation takes around 20 minutes. If you’re building a 250X for cross-country racing, it is worth noting that Durablue is the only axle manufacturer we’re aware of making an extended axle for the 250X, increasing strength while adding stability. With our 250X now sitting around 44.5” wide, it is much more stable allowing us to carry more speed into and out of turns; plus the quad stays more planted on side-hills. The wider rear end spreads the machine’s weight out allowing for more predictable and easier to execute power slides boosting the machine’s fun factor. With added leverage placed on the front shocks, the front suspension is more responsive to small and medium sized impacts. They may bottom a bit easier, but the tradeoff is well worth it. If the added leverage adds any front-end body roll, it is negligible compared to the increase in stability and overall ride quality Our only complaint is a small but manageable increase in steering effort leaving us happy we’d stuck with the +1.5” wheel spacers. The added stability, plusher feeling suspension, and affordability left us feeling good about this upgrade. With our 250X now sitting around 44.5” wide, it is much more stable allowing us to carry more speed into and out of turns; plus the quad stays more planted on side-hills. Looking to make the most of the little pushrod engine, we installed a performance Series Exhaust from HMF. Constructed in the USA, HMF offers the Performance series in a full system only for the 250X. Out of the box, the Honda feels peppy. It pulls well off the low-end and up into the midrange before singing off pretty quickly on top. Looking to make the most of the little pushrod engine, we installed a performance Series Exhaust from HMF. Constructed in the USA, HMF offers the Performance series in a full system only for the 250X. It’s constructed of corrosion resistant stainless steel with a 4” 6063-T6 aluminum silencer shell. The silencer features a 2 1/8” core with a special hole pattern claimed to help increase power evenly throughout the RPM range. 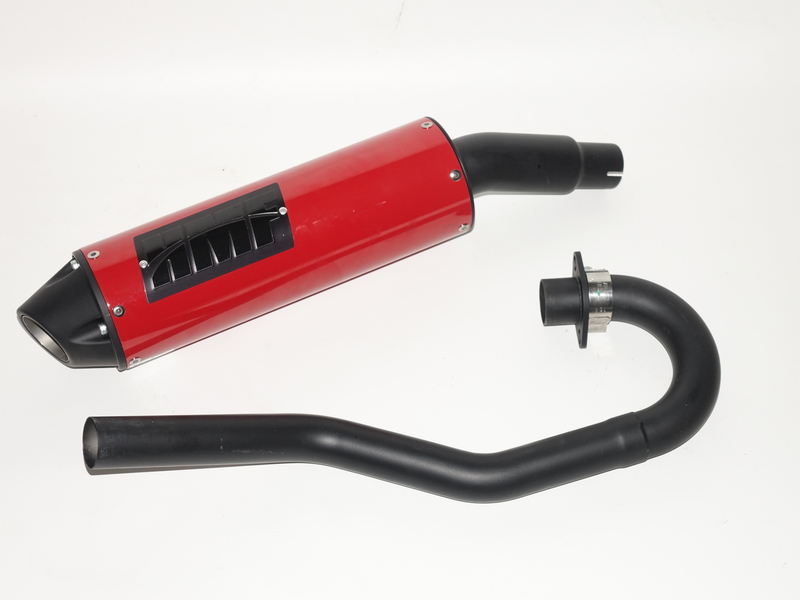 The exhaust comes with a USFS approved spark arrestor along with HMF’s quiet core insert. The Performance Series exhaust is said to increase sound output by 4-6db with the Quiet Core knocking sound output back down by 2-4db. Looks are a matter of opinion and the Performance Series exhaust offers lots of options when it comes to appearance. The silencer can be ordered in brushed aluminum or different powder coat color options. There are two different end-cap styles also available in different colors. HMF’s Blackout option coats the entire exhaust in an extreme temperature resistant, matte black ceramic finish. 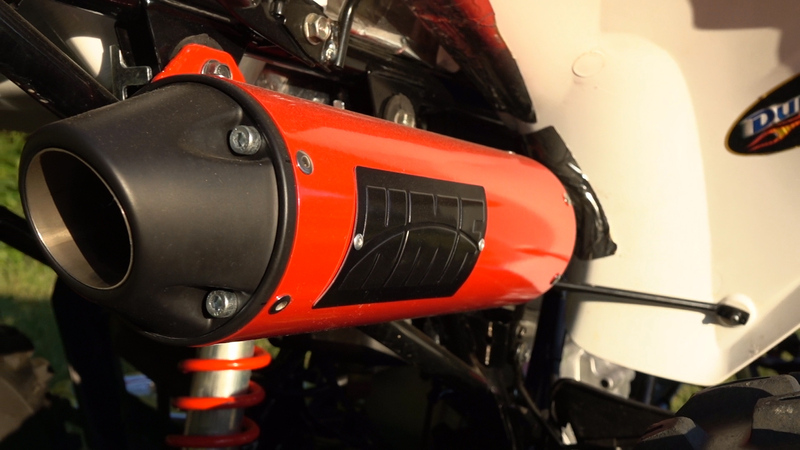 We made it all complicated and ordered our exhaust with the Blackout Ceramic option, complemented with a red silencer shell, which HMF will happily produce for the same price as the full Blackout Option. We think it looks trick and if you don’t, you can order the exhaust to suit your taste. We made it all complicated and ordered our HMF exhaust with the Blackout Ceramic option, complemented with a red silencer shell, which HMF will happily produce for the same price as the full Blackout Option. We think it looks trick and if you don’t, you can order the exhaust to suit your taste. 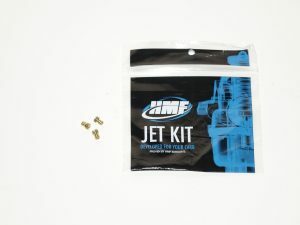 HMF recommends a 100 main jet to complement their exhaust. Their Jet Kit comes with a 100, 105, and 110 main jet. Wanting to ditch the airbox lid for even greater airflow, we installed the largest 110 to start, which proved to be a good choice . After installing our exhaust, we started the machine, which ran like crap. A great sign that we were flowing more air. HMF recommends a 100 main jet to complement their exhaust. Their Jet Kit comes with a 100, 105, and 110 main jet. Wanting to ditch the airbox lid for even greater airflow, we installed the largest 110 to start, which proved to be a good choice . Duncan Racing suggests running a 42 pilot with an aftermarket exhaust and no airbox lid. They also offer a number of internal motor mods for the 250X if you want to build something more radical for cross-country racing. 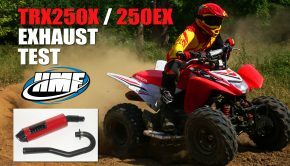 HMF is claiming pretty modest gain of 10-15% on their 250X/250EX exhaust. 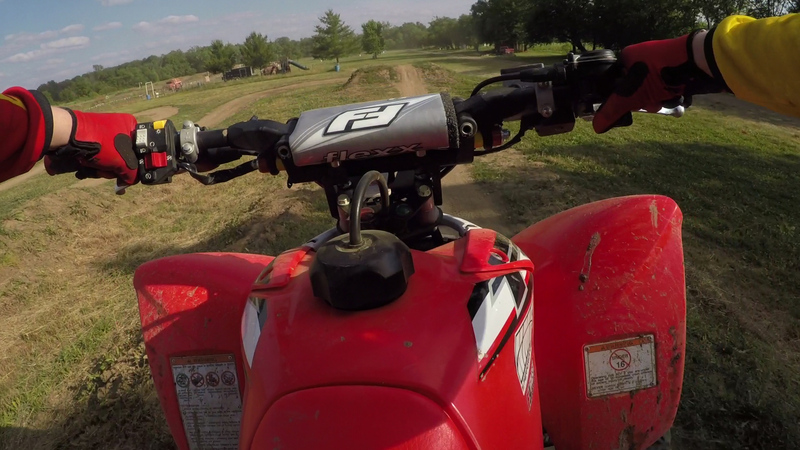 Riding the machine, the difference in power feels pretty evident. There’s a notable increase in throttle response. When you crack the gas, the engine feels a little more playful, responsive, and willing to build RPMs. We noticed an occasional pop at low RPMs when rolling off the gas, a sign that the pilot jet, which controls fuel delivery at lower RPMs, could stand to be a little larger. The rest of the RPM range ran flawlessly with the airbox lid off. Low-end power feels as strong as stock with plenty of grunt to get you rolling or crawl up some pretty steep inclines. Midrange power seemed stronger than stock powering out of corners, but the best gains came in opening up the top-end. Racing down straight sections of trail, we found ourselves often bouncing off the rev limiter, upshifting a while after the stock X would have fallen off. 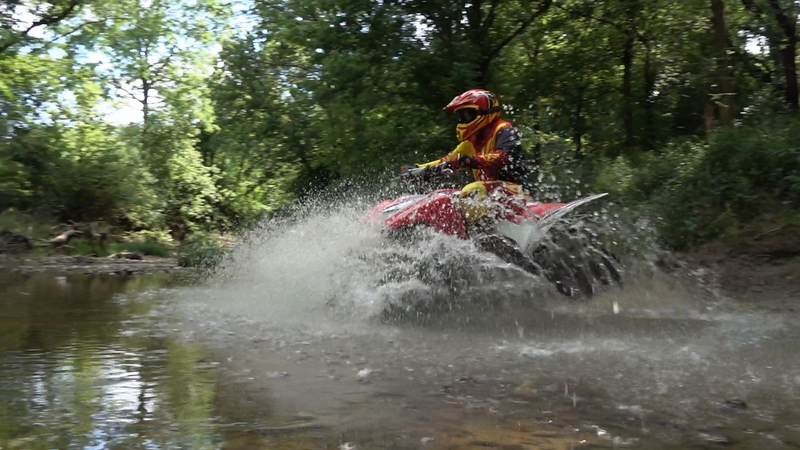 The deep throaty sound also adds to the fun sport ATV experience without being annoyingly loud on longer rides. Of course, it won’t turn your 250 into a 400, but the HMF Performance Series Exhaust definitely helps up the fun factor. Riding the machine, the difference in power feels pretty evident.. The best gains came in opening up the top-end. Racing down straight sections of trail, we found ourselves often bouncing off the rev limiter, upshifting a while after the stock X would have fallen off. 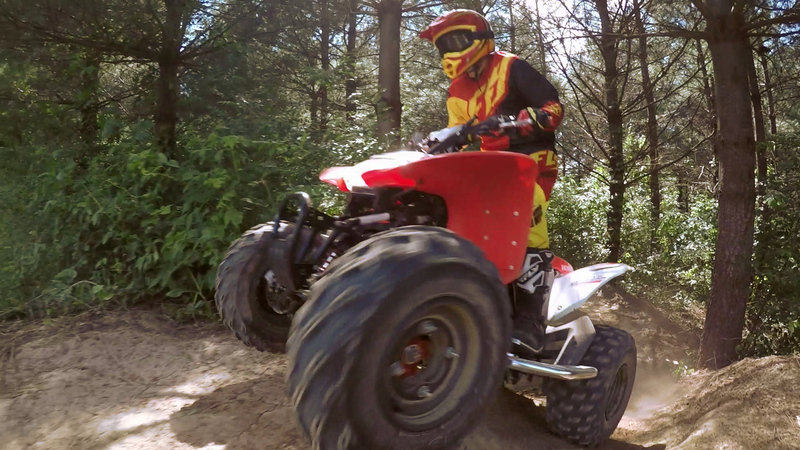 This ATV is all about having fun, and we think our hopped up 250X delivers more of it. With a few hours of installation time and a modest amount of money, we made our 250X a tougher, safer, and more stable ATV with peppier power and, in our overall opinion, increased its overall appeal. This combination of upgrades work well as a whole or you could pick and choose the upgrades that fit your needs best. 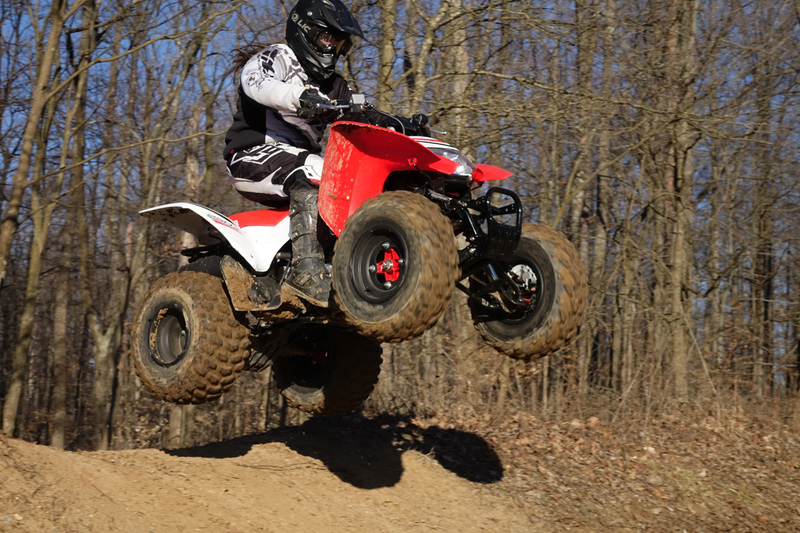 This ATV is all about having fun, and we think our hopped up 250X delivers more of it.